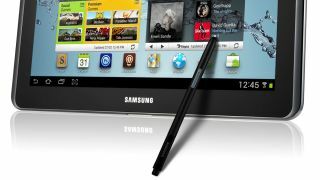 Samsung has announced a number of new apps that utilise the company's S-Pen technology. With the Samsung Galaxy Note 10.1 now sitting alongside the Galaxy Note and rumour the Note is set to get a successor, Samsung is making sure that people are actually putting the S-Pen stylus to work. And the best way to do this is to entice with a bundle of new apps. The S-Pen ready applications are split between Samsung's own app store and Google Play. On the Samsung app store, there's: Drop The Beat, Geotag, Stargazer, Spot Difference, YouDraw and Need For Speed. All of these use the stylus in a different way – for example You Draw tests your drawing skills while Drop The Beat will have you tapping away with your S-Pen like a person possessed. On Google Play, Where Is It?, Trace A Face, The Official Top 40 and Easy Phone Sync have been released – all of which take advantage of the S-Pen's pointy functionality. "The S-Pen is so precise it's inspired a whole host of new apps and we believe it will change the way people use tablet devices," said Simon Stanford, Vice President, Telecommunications and Networks, Samsung UK and Ireland. "For example, the S-Pen makes it easy to edit photos with incredible accuracy on the device's large 10.1-inch screen using the embedded software, Adobe Photoshop Touch." Just don't use it as a toothpick, or coffee stirrer, or anything that's not phone or tablet related really.